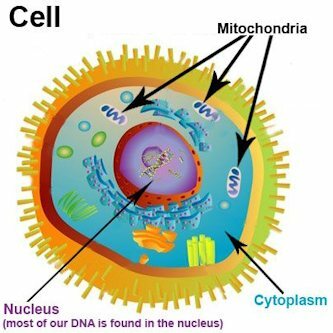 Mitochondrial Fuel - Which Fuel You Burn In Your Mitochondria for Energy Determines How Long Your Mitochondria Last and That Determines How Long You Live! 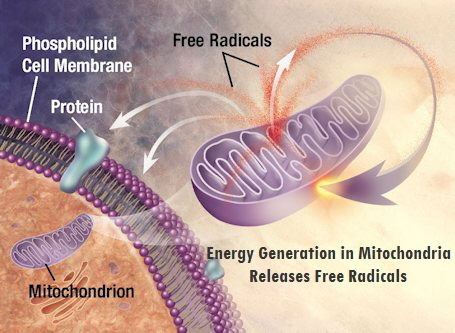 Just As Gasoline Engines Run Best With Gasoline and Not Diesel or Aviation Fuel, So Too, Our Mitochondrial Cellular Engines Run Best With Fat As Fuel, Instead of Sugar! The mitochondria can only burn fat or sugar for energy. Which fuel is burned in the mitochondria for energy determines how long the mitochondria stay in good shape. Creating energy, by burning fuel in the mitochondria, is necessary, but it is destructive to our bodies, just like burning gasoline or diesel is necessary, but destructive to the engine of the automobile. Burning fat in the mitochondria produces more energy than does burning sugar. However, burning sugar is very fast compared to burning fat, and so, sugar burning is very USEFUL DURING TIMES OF EMERGENCY. You could almost say that our cells were designed to burn sugar only temporarily in times of great exigency, when the damage from free radicals is not as important as dealing with the emergency because if our bodies had been designed to primarily burn sugar as a fuel, then we would store sugar cubes within our bodies, but we don’t, we store fat. We store only minor amounts of sugar (in the form of glycogen) — enough to last for 30 to 60 minutes of emergency exertion. The hypothalamus is a gland in the brain that dictates to the entire body which fuel the cells of the body are to use: fat or sugar. The hypothalamus decides which mode to put the body in based on the amount of leptin it can measure in the body. A great number of people’s bodies are being “forced, unnecessarily” to burn sugar instead of fat because that tiny hypothalamus gland believes the body is starving, and, therefore, sends a signal to the cells of the body that sugar should be burned instead of fat (in order to conserve fat). This is unnecessarily causing the mitochondria to “deteriorate faster”. Why Does the Hypothalamus Unnecessarily Force a Sugar Burning Mode in Our Bodies? Too much stress. Stress creates the adrenal gland to relase adrenaline. Adrenaline overrides the hypothalamus signal and instructs sugar burning. Too much blood sugar. Blood sugar (over time) damages receptors in the hypothalamus. When these receptors are damaged then the hypothalamus cannot correctly sense leptin... and believe there is no fat (i.e. starvation is occurring). Too much stored fat. Too much stored fat produces large amounts of circulating leptin which desensitizes the hypothalamus’s ability to detect leptin. When leptin levels are not able to be detected, because the receptors in the hypothalamus have been desensitized, the hypothalamus believes the body is starving and instructs sugar burning in order to conserve and build up fat stores. This is ironic because essential the body’s pantries are full of fat, but these pantries are inaccessible and so the cells are instructed to ignore fat and look for sugar to burn for energy. Reducing stress is the antidote to adrenaline causing sugar burning. To do so, one must eliminate fear, anxiety, and/or sleep deprivation. Sleeping sufficiently, meditation and eliminating causes of stress are the keys. The best way to reduce blood sugar is to drastically reduce one’s consumption of foods that contain sugar and other carbohydrates. The absolute best way to prevent sugar fluctuations is to eat 5 to 6 small meals per day (every 2 to 3 hours), of non sugar/carbohydrate containing foods. Overcoming leptin insensitivity (i.e. repairing the hypothalamus) isn’t so easy. The rather long explanation of why it isn’t so easily overcome is that the bodies of sugar burning people (primarily fat people) have large pantries of stored fat which creates large amounts of the messenger molecule leptin which will push the leptin levels above 9.0 ng/ml and damage the receptors. After a while, the hypothalamus cannot detect leptin at all and thinks that its level is zero, and therefore, instructs sugar burning mode. In a sugar burning mode, it is difficult to entice the body to burn fat stores and therefore very difficult to get rid of fat so that leptin levels will go down to a “fat burning”range of between 4.0 and 9.0. For a fairly in-depth discussion about doing this, please request our Becoming Leptin Sensitive Booklet.